In French cuisine, a quiche is a baked dish that is based on a custard made from eggs and milk or cream in a pastry crust. Usually, the pastry shell is blind baked before the other ingredients are added for a secondary baking period. Left: Quiche with Tomatoes, Mozzarella and Basil. 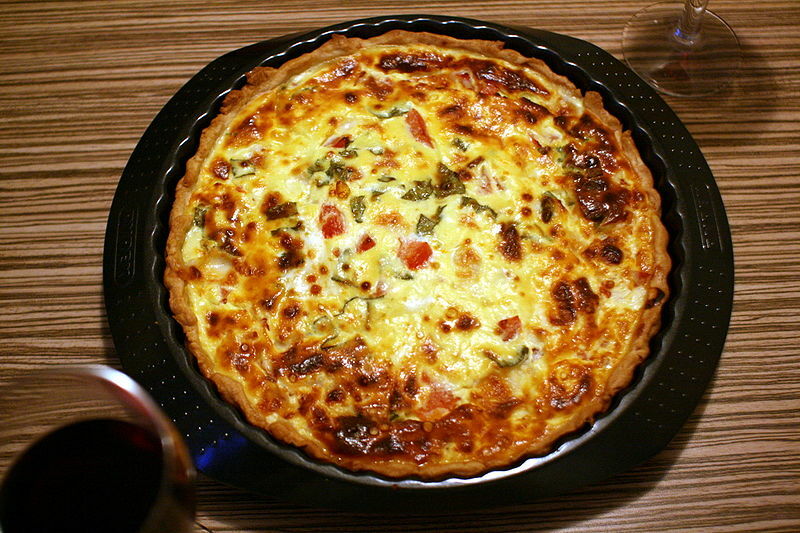 Other ingredients such as cooked chopped meat, vegetables, or cheese are often added to the egg mixture before the quiche is baked. Quiche is generally an open pie (i.e. does not contain a pastry covering), but may include an arrangement of tomato slices or pastry off-cuts for a decorative finish. Quiche can be eaten warm but is more commonly eaten cold, making it a suitable component of the food served in a typical summer picnic. Although quiche is now a classic dish of French cuisine, quiche actually originated in Germany, in the medieval kingdom of Lothringen, under German rule, and which the French later renamed Lorraine. The word ‘quiche’ is from the German ‘Kuchen’, meaning cake. The original ‘quiche Lorraine’ was an open pie with a filling consisting of an egg and cream custard with smoked bacon. It was only later that cheese was added to the quiche Lorraine. Add onions and you have quiche Alsacienne. The bottom crust was originally made from bread dough, but that has long since evolved into a short-crust or puff pastry crust that is often baked using a Springform pan. Quiche became popular in England sometime after the Second World War, and in the U.S. during the 1950s. 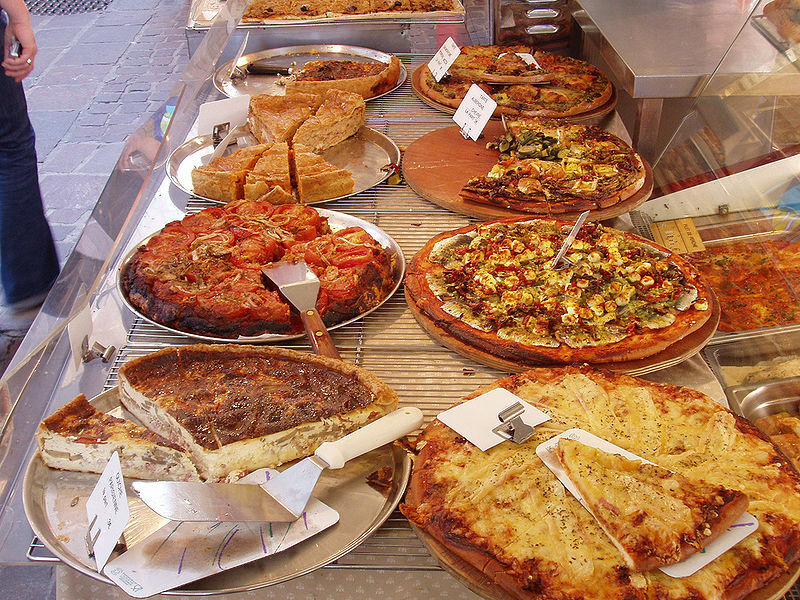 Today, one can find many varieties of quiche, from the original quiche Lorraine, to ones with broccoli, mushrooms, ham and/or seafood (primarily shellfish). Quiche can be served as an entrée, for lunch, breakfast or an evening snack. Left: Different kind of quiches.